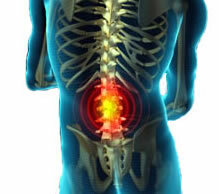 Lower back pain felt in your lower back may come from the spine, muscles, nerves, or other structures in that region. It may also radiate from other areas like your mid or upper back, a hernia in the groin, or a problem in the testicles or ovaries. Signs and symptoms of back pain may vary from person to person, changes in the weather, stress level, physical activity or even the time of day. The following more serious conditions can also cause lower back pain. Lower back pain caused by herniated disk. This occurs when disk material presses on a nerve which causes the pain. Lower back pain caused by sciatica. This condition often occurs when a herniated disk impinges on the sciatic nerve that causes sharp, shooting pain through the buttocks and back of the leg. Lower back pain caused by spinal stenosis. This condition occurs when the space around the spinal cord and nerve roots narrows due to arthritis and bone overgrowth. This can press, pinch a nerve and causes back pain. Lower back pain caused by spondylosis. Spondylosis is a type of arthritis affecting the spine. It is due to the degenerative changes in the spine that often come with aging. Lower back pain caused by cauda equina syndrome. This is a serious neurological problem causing weakness in the legs, numbness in the "saddle" or groin area, and loss of bowel or bladder control. Lower back pain caused by cancer in the spine. A tumor on the spine can press on a nerve causing back pain. Lower back pain caused by infection of the spine. If a fever and a tender, warm area accompany back pain, the cause could be an infection. Lower back pain caused by injury. Damage to the bones, ligaments, or muscles of the back can cause severe pain. In addition, other causes of lower back pain can be poor overall fitness, smoking, and general life dissatisfaction increase a person's risk for low back problems.